With a career that spanned the entire history of rhythm and blues, from '50s doo wop to '80s soul, Marvin Gaye exemplified the maturation of romantic black pop into a sophisticated form spanning social and sexual politics, Marvin Gaye was one of the most consistent and enigmatic of the Motown hitmakers. Marvin Pentz Gaye Jr. (the e was added later) was born April 2, 1939 in Washington D.C. His father was a preacher with the obscure House of God and the two often clashed. He had a brother Frankie and sisters Jeanne and Zeola (Sweetsie). Gaye was three years old when he began singing in his father's church choir and was soon playing the organ and drums, too. Gaye returned to his hometown of Washington, D.C. and started signing in streetcorner doo wop group The Rainbows.. In 1957 he formed his own group the Marquees. Backed by Bo Diddley, they recorded "Wyatt Earp" for the Okeh label. In 1958, Harvey Fuqua hired the Marquees to be the latest version of the Moonglows, his backing group. However the group soon broke up and Fuqua moved to Detroit to form Tri-Phi Records with his girlfriend Gwen Gordy, bringing Marvin with them. It was Gwen that introduced Gaye to her brother Berry at Motown's 1960 Christmas party. Soon Gaye was signed to his new Motown Tamla label in 1961. Gaye started as a session drummer at Motown , playing on all the early hits by Smokey Robinson and the Miracles. "Stubborn Kind of Fellow," "Hitch Hike" and "Can I Get a Witness." Soon thereafter, Gaye married Gordy's sister Anna. "Stubborn Kind of Fellow" Gaye's fourth single, was his first hit in 1962. Over the next ten years working with nearly every producer at Motown, including Holland-Dozier-Holland, Smokey Robinson, and Norman Whitfield, Gaye had over twenty hits. Specializing in mid-tempo ballads, he also had dance hits: "Hitch Hike," (#30, 1963), "Can I Get a Witness" (#22, 1963), and "Baby Don't Do It" (#27, 1964). 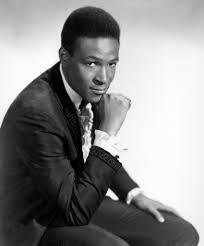 Gaye favored romantic and sometimes sensual ballads and felt that his desire to move into a more mainstream, sophisticated style was hampered by Motown's demand for hits. For a singer as unenthusiastic as Gaye later claimed to be, he gave almost every song an inspired reading. His Top Ten Hits include "Pride and Joy," (#10, 1963), "I'll Be Doggone" (#8, 1965), "Ain't That Peculiar" (#8, 1965), and "How Sweet It Is to Be Loved By You" (#6, 1965). Among his other thirty nine Top Forty singles of this period were "Try It Baby" (#15, 1964) with background vocals by the Temptations, "You're A Wonderful One" (#15, 1964, with backing vocals by the Supremes). In 1964, Gaye did duets with Mary Wells "Once Upon a Time (#19, 1964) and "What's the Matter With You" (#17, 1964) and Kim Weston for "It Takes Two" (#17, 1967). However, his greatest duets were with Tammi Terrell: "Ain't No Mountain High Enough" (#19, 1967), "Your Precious Love" (#5, 1967), "Nothing Like the Real Thing" (#8, 1968), and "You're All I Need to Get By" (#7, 1968) all written and produced by Ashford and Simpson. In 1967 concert, Terrell collapsed into his arms on stage, the first signs of a brain tumor that would kill her three years later. Gaye had his biggest hit of the Sixties with "I Heard It Through the Grapevine" (#1, 1968). The second phase of Gaye's career began in 1971 with "What's Going On". One of Motown's first artist to have complete artistic control over his records. "What's Going On" was a self-composed and produced song cycle that could be called a concept album. The album hit number six and produced three Top Ten Singles: "What's Going On" (2, 1971), "Inner City Blues (Make Me Wanna Holler" (#9, 1971, and "Mercy Mercy Me (the Ecology)" (#19, 1974), but the project was one of the many things Gaye did with Motown that he felt was forced upon him. Gaye's rocky marriage to Anna Gordy end after fourteen years as the Seventies came to a close. Reeling from the divorce settlement Gaye filed for bankruptcy. He married his second wife Janice in 1977 and had a #1 hit, "Got to Give It Up, Part 1." They had two children Nona, who became a recording artist and Frankie. I.R.S. pressures forced Gaye to move to Europe to record his 1981 release, In Our Lifetimes, which concentrated on his philosophies of love, art, and death. In 1982 he left Motown for Columbia. His first Columbia album Midnight Love sold two million copies and included Sexual Healing" which won a Grammy for Best R&B Vocal Performance, Male. He sang live at the Grammy broadcast and in 1983, in concert at the Radio City Music Hall. Also in 1983, he appeared in one of the more memorable segments of the Motown 25th anniversary television special. Despite his success, Gaye was depressed and was abusing cocaine. He moved back to the U.S. and into his parents home. where he often quarreled with is father who he had been at odds with since his teenage years. In early 1984, Gaye reportedly threatened suicide several times before his father shot him following a Sunday morning shouting match April 1, 1984. After his death Columbia and Motown collaborated to produce Dream of a Lifetime and Romantically Yours, both based on unfinished recordings from the Sexual Healing sessions. In 1992, his daughter Nona launched her own recording career on Third Stone Records. Motown issued a tribute album to Marvin Gaye in 1995.